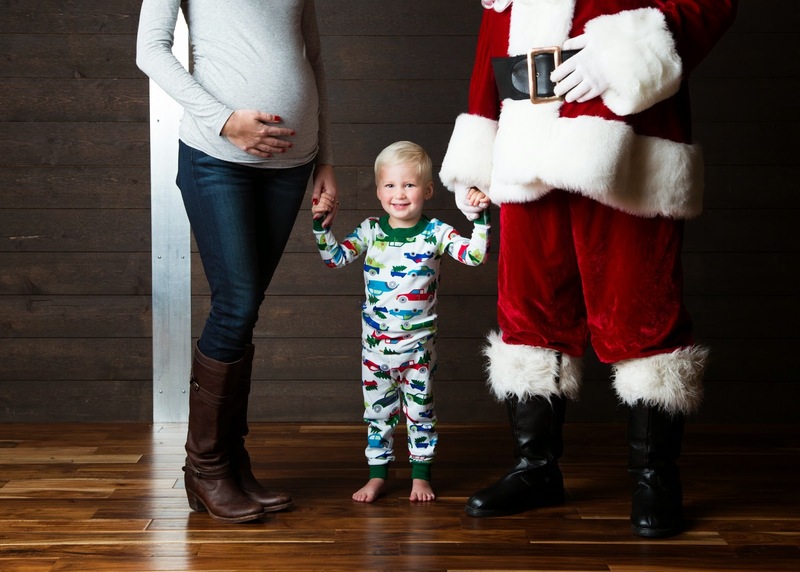 I had been looking forward to our Santa photos all week and was really trying to build up the experience for Liam! He's a new candy cane lover, so the fact that Santa was going to be handing them out like it was his job (which it is), made my little boy plenty excited! We went back to the same place at Thanksgiving Point as last year, where Conor got to dress up as Santa to make Liam a bit more at ease. I love this style of Santa photos and the unique poses. Of course, I had to sneak my bump into this years photos... something to mark this Christmas by! They also have a "real" Santa, so kids still have the traditional lap to sit on & candy cane reward. There were no tears this year (yay for my brave little boy), but he was definitely shy & skeptical. He would barely look up at us, and really his face was saying "I just want to eat my candy, must I keep sitting on this guy?!" So we snapped a quick pic, the best we could get, and went along our merry way. Last year, there was a huge snowstorm the night we did our photos, so all the grounds of Thanksgiving Point were just beautiful! A true wonderland of snow. We've had ridiculously high temps lately, so a bit of that magic was missing, but we still enjoyed a good reindeer viewing. Liam has completely embraced much of this new "Christmas world" that we've been reading about in his books, so he's all about reindeer right now! He wanted to pet them, but of course, they were just out of reach. We finished the night with a drive through the holiday lights! Liam "drove" while the Christmas music was blasting! I just love this time of year and can't wait for all the fun still to come... like our North Pole Express train ride on Saturday! This is such a cool way to do santa! I really wish they had this here! We are doing a santa train this weekend too! I really love how they are now old enough to enjoy these things now!!! That is such a neat idea! I've never seen Santa photos done that way. You have an adorable little family! I've only ever seen it done here, but it really should be a new concept that everywhere adopts, makes for much happier kiddos! omg all I have to say is the leg one! LOVE! Hope yall have great weekend! Oh my gosh what a neat place! Love all the pictures of part of Santa and Liam!! That is such a good idea. these photos are perfect!!! I love that you have unique photos like this from Santa!!! Liam looks like he had a good time! And YAY for no crying. I hope same goes for us this year too!!! I love this whole idea! I wish it was a more widely done operations; it would make for much happier kiddos! So I just went and looked at Fotofly Santa...why don't they have these everywhere? This is the best idea ever!!!! Oh, these pictures are just perfect! How cute does he look sitting on Santa's lap?!? So sweet! I remember this from last year, I love it so much!!! It's just a wonderful idea! We're going this weekend and I'm taking cookies. I'm hoping maybe he'll sit on Santa's lap and eat his cookie. I know, I'm laughing at myself too, ha! How fun! I love those photos -- so pretty! 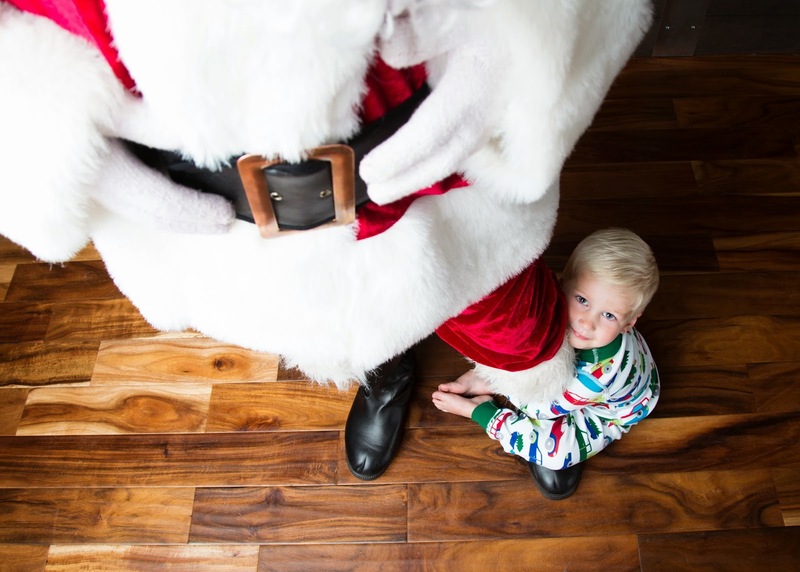 Those are the best Santa photos ever! Such cute poses. Aria would probably flip for reindeer. We just read the wild reindeer, or wild Christmas reindeer or something for her book advent. Oh my goodness, those first photos... AMAZING. I am LOVING them all! Especially that one of him opening the present. The PERFECT Christmas photo! Oh my gosh, these pictures are PERFECT! Seriously, I looooooove!! 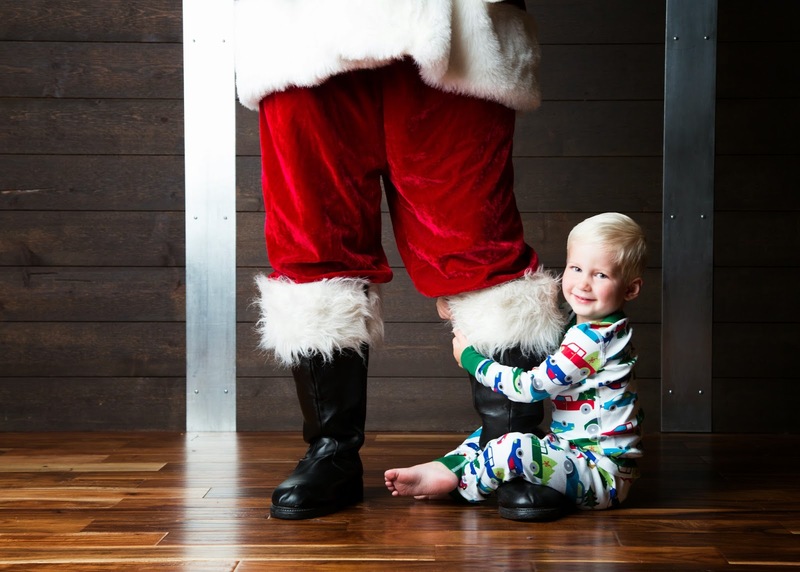 Such a great idea for Santa photos!! I love the one with your bump too, so cute!!! Liam is just precious! 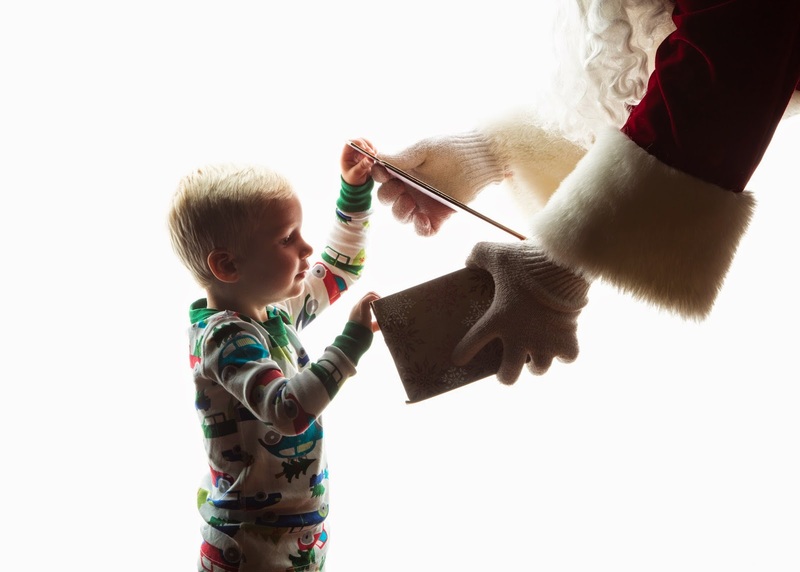 These are THE MOST adorable Santa photos I have ever seen! Gorgeous bump and super handsome little dude!